The Pacific Crest Trail, by its very nature, routed on or near the crest, has long waterless stretches. Water can be scarce, especially in parts of California, which often creates challenges for trail users. And because of that, it can adversely affect the environment. For example, many PCT travelers who have been hiking or horseback riding all day plan to get to a water source at the end of the day. They unload their pack and equipment and set up camp near the water source – sometimes even only a few feet away from the water – and settle in for a relaxing evening. In many cases, the water source is no more than a small seasonal stream. If this is the only water source available for many miles, there may be several people gathered around vying for a flat camp spot near the water. Not only can this cause overcrowding, which is contrary to one of the reasons many people strike out on the PCT, the fragile ecosystems and plant and animal life around the water sources can be damaged. It takes very little for humans to damage these places and a long time for them to recover, if at all. Carry a little bit of water away from the water source. Dry camping is a fantastic Leave No Trace tactic and it frees you up to find some stunning camp spots. As the PCT becomes more popular, the number of users increases. Water sources become more scarce with ongoing drought. These forces are colliding and the influence they are having on the trail experience and the environment is being exacerbated. So, what is the camping alternative in areas where water sources are many miles apart? We highly encourage people to dry camp when possible. Toward the end of the day, get to that water source, fill up your containers and head off to find your own unique spot for the night! Rather than hunkering down next to that fragile water source consider these upsides. 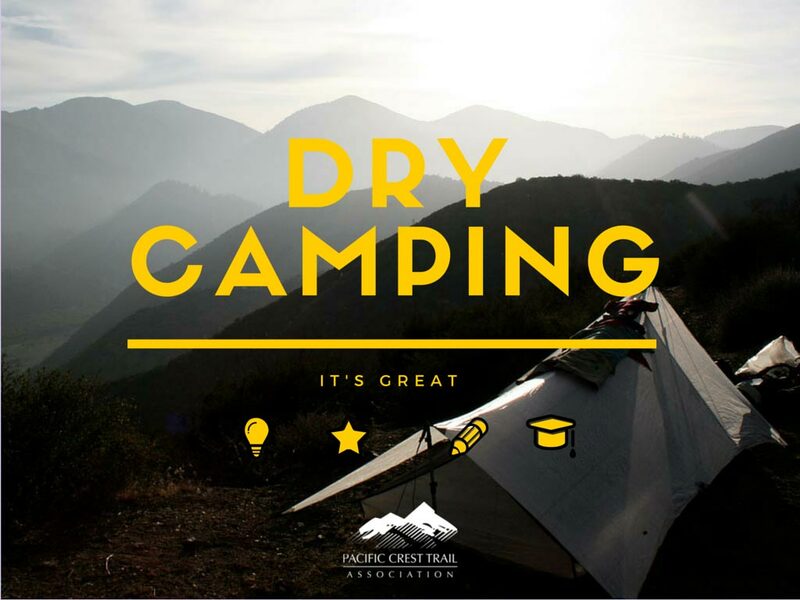 Practice Leave No Trace principles and protect the surrounding environment; By dry camping, you have less of an impact on that rare, fragile ecosystem that the surrounding plants and animals depend on. Increased solitude; By dry camping, you increase your opportunity for a remote and solitary experience; as well, you will help others to have the opportunity for solitude. Unique trail experience; After filling up your water for the evening, go find a quiet area or vista point to make your home for the night. Increased self reliance; By having the capacity to carry enough water to last for an evening and part of the next day, PCT users are more self reliant and more prepared for unexpected situations or injuries. Our most remote and scenic campsites have generally been when we were dry camping. We filled up on water, hiked down the trail or climbed up an interesting ridge and found a scenic and secluded spot. Yes, these were steps taken off the trail and energy expended that wasn’t propelling us down the PCT proper; however, isn’t the landscape around the PCT what makes it so remarkable? If so, then go and explore the surrounding ridges and vista points off of the PCT and find those sheltered, secluded areas that few enjoy. Minimize your footprint on those fragile riparian environments and revel in the solitude!